So It seems later in November doesn’t mean late in November after all. A certain amount of online interest was generated late yesterday afternoon when the Apple Online Store went offline, returning a short time later featuring the iPad mini with Retina display, shipping in 1–3 business days (16 or 32GB Wi-Fi models; remaining variations in 5–10 business days). I have previously written about my intentions to upgrade to the Retina model from my current iPad 2, as it will better suit my mobile commuting and needs. The only concern is actually obtaining one, as all indications point to a very limited release due to constraints in the supply chain. Obviously there are no surprises (apart from the release timing) in relation to the device itself, with the specifications announced last month when Apple launched the mini and its larger sibling, the iPad Air. All of the goodness is now common for both devices, including the A7 chip, M7 co-processor and 64 bit architecture. The mini now catching up to the larger version in both internal hardware and 2048×1536 Retina screen. As yet there is no word on availability with retail partners, and my Twitter updates seem to suggest varying availability in Apple Stores country to country. I guess time will tell, however I will be visiting a couple of retail outlets today out of interest. In any event, it appears those who have deferred the iPad Air vs iPad mini with retina display purchasing decision now have to make a call (with the exception of those lucky souls who will end up with both). 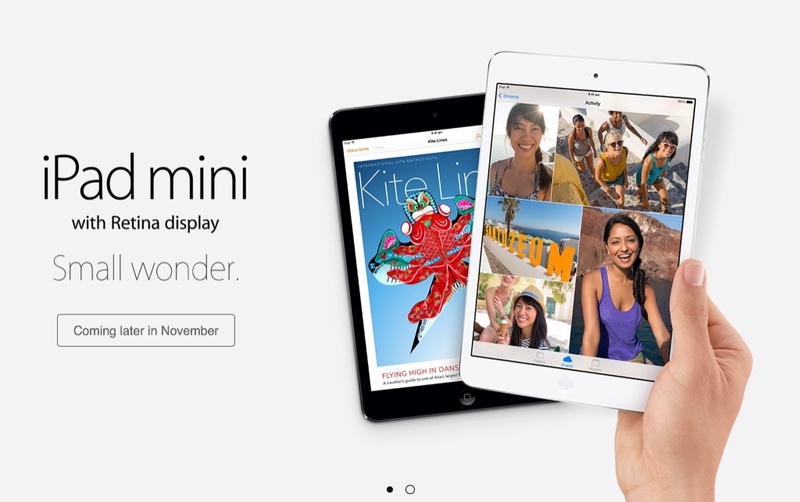 The iPad mini with retina display is available for order through the the Apple Online Store now, starting at $479 AUD (16GB Space Grey or White Wi-Fi models).